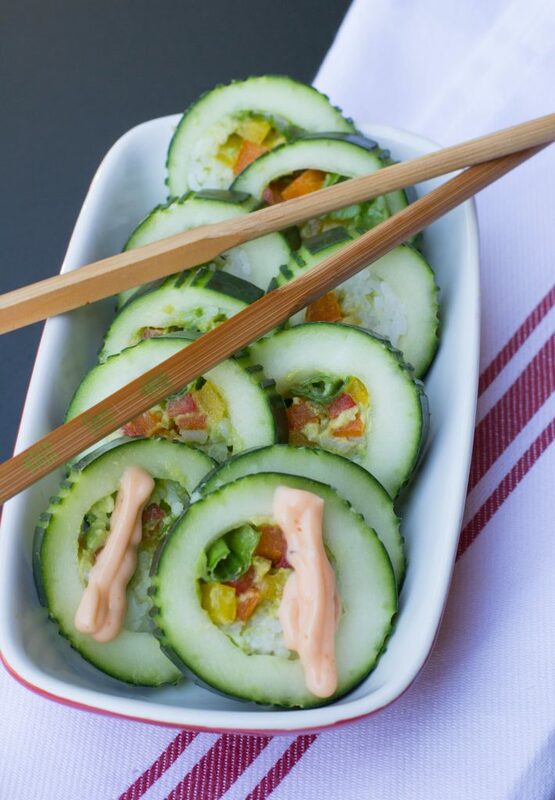 Cucumber Sushi - What the Forks for Dinner? 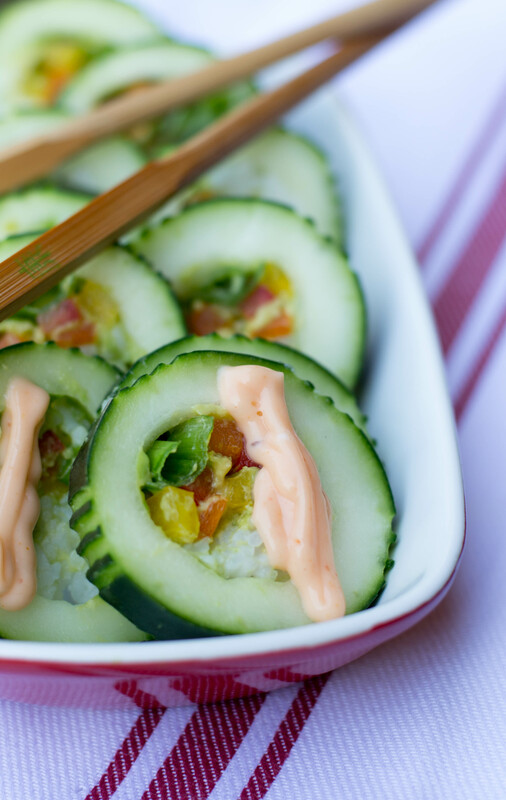 As anyone who gardens knows, when cucumbers come on they come on…… Cucumber Sushi lets you make the best of your over abundance. As I was making this recipe, which I found on …..you guessed it Pinterest…..one of my friends on Facebook posted a photo of her first crop of cucumbers…..so Brenda, here is a little something you can do with those green beauties. The recipe is from Sarah at Live Eat Learn and when I saw the recipe I knew I had to try it. I have had real sushi maybe twice…….not sure if I “love” it but I did like the flavors of the sauces and the veggie-avocado component. So, when I saw this faux sushi recipe I was intrigued. The recipe was fairly easy, no complicated ingredients and looked cool and refreshing…….it was! I used a melon baller to hollow out the inside of the cucumbers. The original recipe had you making rice, but I purchased sticky rice from the Oriental section of the grocery store. It’s already cooked and …..well sticky, which is what you need for this recipe. Cutting up the veggies takes virtually no time. The only tricky part is getting everything inside. But, a little persistence and patience, and in no time your rolls are stuffed. The first ones I cut, I cut a little too thin and the stuffing came out. Besure to cut them at least an inch thick. I made a spicy mayo as the original recipe called for, but wasabi, or soy sauce would be tasty also. 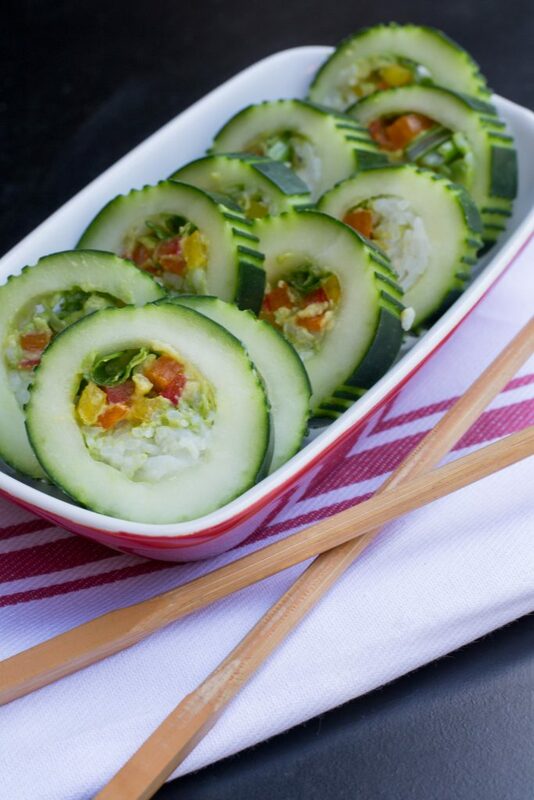 So for a cool refreshing appetizer, or snack…….try Cucumber Sushi. Cut each cucumber in half and remove seeds with either a small spoon or knife to create a long, hollow tube. Spoon in a small amount of rice, then compress towards one side of the tube. Gently insert a slice of avocado and a few slices of pepper, then add more rice to fill gaps, compressing and adding more rice until packed full. Be gentle, especially if your avocado is ripe and soft! 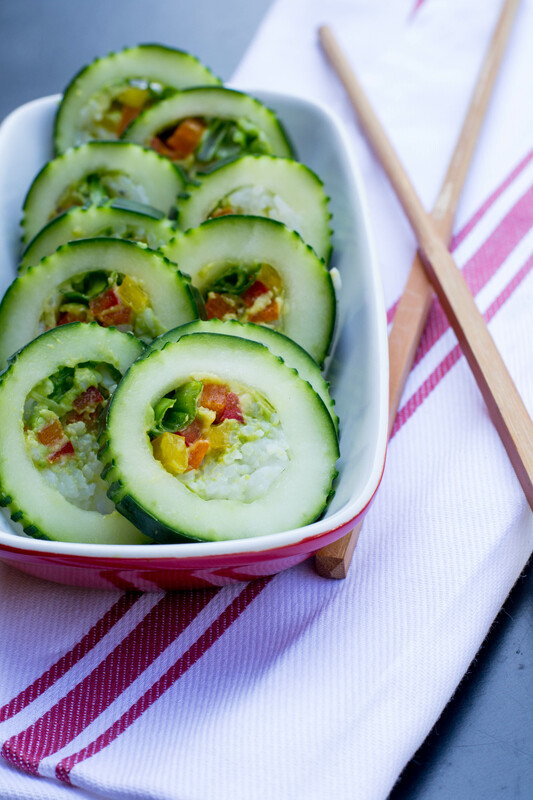 With a sharp knife, slice cucumber into 1 inch thick pieces (thinner if you’re a daredevil). If you start to notice the filling is loose as you cut, stuff in some rice and peppers where needed.